According to DIN EN 10052:1994-01, nitriding is defined as the thermo-chemical treatment of a work piece in order to enrich the surface layer with nitrogen. Carbo-nitriding involves enriching the surface layer with nitrogen and carbon. The nitriding process, which was first developed in the early 1900s, continues to play an important role in many industrial applications. It often is used in the manufacture of aircraft, bearings, automotive components, textile machinery, and turbine generation systems. It remains the simplest of the case hardening techniques. The basic of the nitriding process is that it does not require a phase change from ferrite to austenite, nor does it require a further change from austenite to martensite. In other words, the steel remains in the ferrite phase (or cementite, depending on alloy composition) during the complete procedure. This means that the molecular structure of the ferrite (bcc) does not change its configuration or grow into the face-centered cubic (fcc) lattice characteristic of austenite, as occurs in more conventional methods such as carburizing. Also, since only free cooling takes place, rather than rapid cooling or quenching, no subsequent transformation from austenite to martensite occurs. Again, there is no molecular size change and, more importantly, no dimensional change, only slight growth due to the volumetric change of the steel surface caused by the nitrogen diffusion. What can (and does) produce distortion are the induced surface stresses being released by the heat of the process, causing movement in the form of twisting and bending. The purpose of nitriding is to enrich the surface layer of a work piece with nitrogen in order to increase the hardness in the surface. The process of nitriding takes advantage of the low solubility of nitrogen in the ferritic crystal structure to promote the precipitation of iron nitrides or alloy nitrides. With a nitrogen content of a few percent, a nitride layer that is mostly cohesive (connecting layer) forms on the surface. 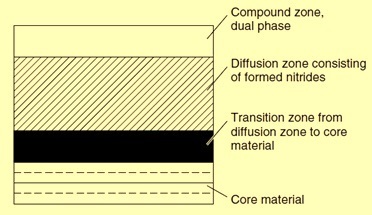 This layer is connected to a diffusion zone, in which the precipitated nitrides are evenly distributed in the steel matrix and which results in hardening, particularly for alloyed steels. Since nitrogen lowers the gamma / alpha transformation temperature of iron down to 590 deg C, the nitriding temperatures are generally below this temperature. The lower limit for the nitriding temperature is considered to be 350 deg C, because below this temperature, nitrogen diffusion does not occur on a rate that can be exploited technologically or economically. As temperatures decrease, the nitriding time necessary to reach a given depth of hardness increases. The depth of nitriding hardness may reach 500 ?m with maximum hardness levels of > 1000 HV. Since warming up and cooling down occurs slowly and the basic structure does not undergo any transformation or change in volume, there is only a low risk of deformation. Nitriding is a ferritic thermo-chemical method of diffusing nascent nitrogen into the surface of steels and cast irons. This diffusion process is based on the solubility of nitrogen in iron, as shown in the iron-nitrogen equilibrium diagram (Fig. 1). The ? 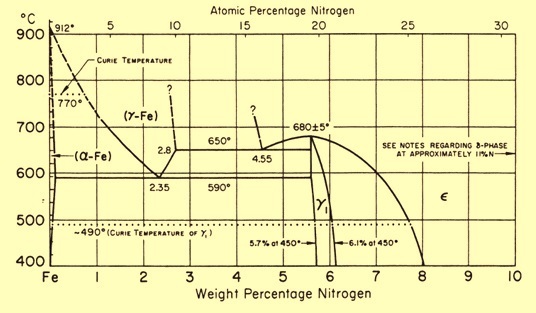 phase, which is not shown on the iron – nitrogen equilibrium diagram at Fig 1, exists from 11 % to 11.35 % N at temperatures below approximately 500 deg C.
The solubility limit of nitrogen in iron is temperature dependent, and at 450 deg C the iron base alloy absorbs up to 5.7 % to 6.1 % of nitrogen. Beyond this, the surface phase formation on alloy steels tends to be predominantly epsilon (?) phase. This is greatly influenced by the carbon content of the steel. The greater the carbon content, there is higher potential for the ?phase to form. As the temperature is further increased to the gamma prime (??) phase temperature at 490 deg C, the limit of solubility begins to decrease at a temperature of approximately 680 deg C. The equilibrium diagram shows that control of the nitrogen diffusion is critical to process success. There are three main processes for nitriding. These processes are gas nitriding, salt bath nitriding, and plasma nitriding. In gas nitriding the donor is a nitrogen rich gas, usually ammonia (NH3). It is sometimes known as ammonia nitriding. When ammonia comes into contact with the heated work piece it disassociates into nitrogen and hydrogen. The nitrogen then diffuses onto the surface of the steel creating a nitride layer. This process has existed for nearly a century, though only in the last few decades has there been a concentrated effort to investigate the thermodynamics and kinetics involved. Recent developments have led to a process that can be accurately controlled. The thickness and phase constitution of the resulting nitriding layers can be selected and the process optimized for the particular properties required. A number of operating process parameters are needed to be controlled in order to successfully carry out the nitriding process. Most of these parameters can be controlled with relatively simple instrumentation and methods. These process parameters for gas nitriding include (i) furnace temperature, (ii) process control, (iii) time, (iv) gas flow, (v) gas activity control, and (vi) process chamber maintenance etc. All these factors help to reduce distortion during the process, with the exception of induced residual stresses. Important control factors for gas nitriding are as follows. The advantages of gas nitriding process are (i) precise control of chemical potential of nitrogen in the nitriding atmosphere by controlling gas flow rate of nitrogen and oxygen, (ii) all round nitriding effect, (iii) large batch sizes possible, (iv) with modern computer control of the atmosphere the nitriding results are closely controlled, and (v) relatively low equipment cost. The disadvantages of gas nitriding process are (i) reaction kinetics heavily influenced by surface condition, (ii) surface activation is sometimes needed to treat steels with high chromium content, and (iii) ammonia is used as nitriding medium which is though not toxic but can be harmful when inhaled in large quantities. Also care is required taken when heating in the presence of oxygen to reduce the risk of explosion. The salt bath process uses the principle of the decomposition of cyanide to cyanate and the liberation of nitrogen within the salt for diffusion into the steel surface. Normally the salts used also donate carbon to the work piece surface making salt bath a nitro-carburizing process. The temperature used is typical of all nitro-carburizing processes which are 550 deg C – 570 deg C. The advantage of salt nitriding is that it achieves higher diffusion in the same period time compared to any other method. Other advantages of salt nitriding are quick processing time usually around 4 hours and simple operation. The disadvantages of the process are that the salts used are highly toxic and only one process is possible with a particular salt type since the nitrogen potential is set by the salt. It is also known as ion nitriding, plasma ion nitriding or glow-discharge nitriding. In plasma nitriding, the reactivity of the nitriding media is not due to the temperature but to the gas ionized state. In this technique intense electric fields are used to generate ionized molecules of the gas around the surface to be nitrided. Such highly active gas with ionized molecules is called plasma. The gas used for plasma nitriding is usually pure nitrogen, since no spontaneous decomposition is needed. The significance of the plasma nitriding process is that it does not rely on the decomposition or cracking of a gas to liberate nascent nitrogen on the steel surface. The process is based on the ionization of a single molecular gas, which is nitrogen, and the liberation of nitrogen ions. The process offers a shorter cycle time due to the steel surface preparation and the gas ionization. Nitriding is not now restricted to steels that required specific nitride-forming elements. Today plasma nitriding is carried out on virtually all steels and cast irons. Usually steels are beneficially treated with plasma nitriding. This process permits the close control of the nitrided microstructure, allowing nitriding with or without compound layer formation. Not only the performance of steel parts is enhanced, but working life spans also increase, and so do the strain limit and the fatigue strength of the steels being treated. A plasma nitrided part is usually ready for use. It calls for no machining, or polishing or any other post-nitriding operations. Thus the process is user friendly, saves energy since it works fastest, and causes little or no distortion. Since nitrogen ions are made available by ionization, differently from gas or salt bath, plasma nitriding efficiency does not depend on the temperature. Plasma nitriding can thus be performed in a broad temperature range, from 260 deg C to more than 600 deg °C. For instance, at moderate temperatures (like 420 deg C), stainless steels can be nitrided without the formation of chromium nitride precipitates and hence maintaining their corrosion resistance properties. In plasma nitriding processes nitrogen gas is usually the nitrogen carrying gas. Other gasses like hydrogen or argon are also used. Indeed, these gases are used before the nitriding process during the heating of the parts to clean the surfaces to be nitrided. This cleaning procedure effectively removes the oxide layer from surfaces and may remove fine layers of solvents that could remain. This also helps the thermal stability of the plasma unit, since the heat added by the plasma is already present during the warm up and hence once the process temperature is reached the actual nitriding begins with minor heating changes. For the nitriding process hydrogen gas is also added to keep the surface clear of oxides. The microstructure of nitrided iron is shown in Fig 2. It is clear that the compound layer is composed of sub layers of ? phase and ?? phase. The ? phase is close to the surface and the ?? phase is near to the diffusion zone. The schematic of a typical nitrided structure is given in Fig 3. Examples of easily nitridable steels include the SAE 4100, 4300, 5100, 6100, 8600, 8700, 9300 and 9800 series, UK aircraft quality steel grades BS 4S 106, BS 3S 132, 905M39 (EN41B), stainless steels, some tool steels (H13 and P20 for example) and certain cast irons. The material of choice is generally a nitriding steel, alloyed steels with nitride-forming elements. The steels for nitriding are chromium-molybdenum steels and contain aluminum, which produces a much higher surface hardness after nitriding. Out of the nitride forming elements aluminum, chromium, vanadium and molybdenum, the elements chromium and aluminum particularly affect surface hardness. However, 1 % aluminum results in a higher increase in hardness than 3 % chromium, and it is independent upon the carbon content of the steel since aluminum does not form carbides and is therefore fully available for nitride formation. Lower contents of molybdenum and vanadium improve the tempering resistance and reduce sensitivity to temper embrittlement. The higher surface hardness, which is caused by the additional alloy elements, results in a lower tendency to adhere to a wear partner and in increased abrasion resistance. However, the increased surface hardness also leads to a higher risk of cracking during mechanical stressing. Aluminum has a strong affinity for nitrogen, forming very hard aluminum nitrides that are quite stable in amounts up to 1.0 % aluminum. Above 1.0 %, aluminum has no effect on the resultant nitriding hardness. Since the deformability of the nitrided component not only depends on the thin, hard nitride layer but also on the chemical composition and structure of the base material, the following is true for all nitrided steels: The more homogenous and fine-grained the structure is, the better the nitriding result. However, generally, the tempered initial state (QT) is preferred over the soft annealed state (A). The nitrogen is transferred from the surrounding medium in the following steps. Nitrides form around seed points on the surface of the component (grain boundaries and nodes at which several grains meet). As the nitrogen concentration and nitriding time increase, the nitrides grow deeper and expand laterally into the grains until a closed layer has been formed. Along with the nitride forming alloy elements, nitrides form and disperse sub microscopically in the matrix. It is almost unavoidable that this layer displays a certain degree of porosity. This is due to a recombination to molecular nitrogen in energetically suitable spots, such as grain boundaries, in the connecting layer. The connecting layer may be brittle with a tendency to chip and is therefore removed by means of grinding in some cases. The adjacent diffusion zone affects strength characteristics (fatigue resistance) and increases resistance against rolling wear and abrasion. The composition of nitride layers may be modified significantly by adapting nitriding conditions and systematically selecting materials. The transition from the hardness of the diffusion zone to the core hardness of the base material is fluid, which, unlike surface layers, reduces the risk of chipping during mechanical stressing. Nitride layers are also heat resistant up to approx. 550 deg C.
The depth of nitriding hardness is a characteristic value for the thickness of the nitride layer. It describes the vertical distance from the surface to the point at which the hardness is still 50 HV higher than the core hardness. As the tempering temperature increases, the amount of Cr and Mo carbides increases as well. This reduces the precipitation of nitrides and results in a lower increase in hardness. The nitriding temperature should be below the tempering temperature in order to keep the core hardness from decreasing. Steel grades containing aluminum form more aluminum oxides that deteriorate the microscopic, oxidic level of purity and prevent the diffusion of nitrogen into the component surface if the precipitation occurs on the surface of the component. The higher is the alloy content of a base material (the nitriding steel), the higher the surface hardness that can be achieved. The compressive residual stress in the nitrided surface layer also increases, which leads to higher fatigue strength. This, however, also reduces the depth of nitriding hardness that can be achieved because the alloying elements impair diffusion of the nitrogen into the interior of the component.